The 2017 Genesis G80 mid-luxury sedan, offered in rear-wheel-drive or HTRAC® All-Wheel-Drive, is powered by either a 311 horsepower 3.8-liter Lambda engine or a 420 horsepower 5.0-liter Tau V8 engine, both mated to an eight-speed automatic transmission with SHIFTRONIC® manual shift capability with steering wheel paddle shifters. Saftey features include Automatic Emergency Braking, Lane Keep Assist and Blind Spot Detection with Lane Change Assist and Rear Cross-traffic Alert. The Genesis G80, Hyundai's luxury brand's new flagship car, targets shoppers of the Cadillac CTS, Lexus GS, Infiniti Q70, BMW 5-Series and Mercedes E-Class. The 2017 Nissan Pathfinder has a new 284 horsepower 3.5-liter V6 engine ((up from the previous 260 horsepower) with maximum towing capacity increasing by 1,000 pounds to 6,000 pounds (when properly equipped). Exterior enhancements include new front bumper, fog lights, outside rearview mirrors with integrated turn signals and new 18-inch and 20-inch aluminum-alloy wheel designs. In the rear, changes include new taillight and bumper designs. Available advanced Driver Assistance technology includes new Forward Emergency Braking and Intelligent Cruise Control. Moving Object Detection has been added to the available Around View® Monitor and Blind Spot Warning and Rear Cross Traffic Alert are also offered. There's an available Motion-Activated liftgate with liftgate position memory, which is standard on SL and Platinum grades. The 2017 Nissan Pathfinder goes on sale at Nissan dealerships nationwide this Fall. The new 2017 Porsche Panamera offers a choice of the 550 horsepower Panamera Turbo and the 440 horsepower Panamera 4S mated to a new eight-speed dual-clutch transmission and equipped with all-wheel drive as standard. 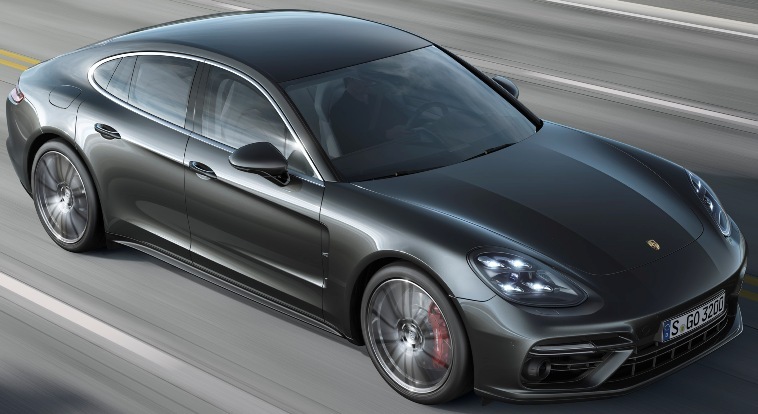 The Panamera now features a new three-chamber air suspension, rear axle steering and the new electronic 4D Chassis Control chassis management system. Porsche Connect is being introduced in all models. Since it launched in 2009, over 150,000 Panameras have been sold. General Motors (Chevrolet, Buick, Cadillac, GMC) sold 255,210 vehicles, down 1.6 percent and through the first six months of the year, GM sales are 1,438,915, down 4.4 percent from the first half of 2015. Ford Motor Company’s June sales were 240,109 vehicles, up 6 percent with first-half total U.S. sales of 1,353,048, up 5 percent for its best first-half performance since 2006. Toyota Motor Sales reported June 2016 sales of 198,257, a decrease of 5.6 percent from June 2015. For the first half of the year, TMS reported sales of 1,197,800, down 2.7 percent versus the same period in 2015. Toyota division posted June 2016 sales of 172,478, down 6.2 percent and Lexus posted June sales of 25,779, down 1.3 percent. FCA US (Chrysler, Dodge, Ram, Jeep, Fiat, Alfa Romeo) reported U.S. sales of 197,073, a 7 percent increase compared with sales in June 2015 and the group’s best June sales in 11 years. Year-to-date sales of 1,152,259 is a 6 percent rise over the first of 2015. Nissan Group (Nissan and Infiniti) announced total U.S. sales for June 2016 of 140,553, an increase of 13 percent over the prior year and a June record. Year-to-date sales of 798,114 is an 8.4 percent rise over 2015. Nissan Division June sales were 129,495, up 13.4 percent over June 2015 while Infinti June sales were 11,058, a gain of 10.7 percent. American Honda reported June sales of 138,715 Honda and Acura vehicles, a year-over-year increase of 3.2 percent. Total American Honda six-month sales of Honda and Acura vehicles are 792,355, up 5.2 percent versus year-ago results. Hyundai Motor America reported sales of 67,511 for the month of June, up 9 vehicles over a year ago and the company’s best June ever. Year-to-date sales of 374,061 is up 0.8 percent over last year and represents Hyundai’s best first six months ever. Kia Motors America’s June sales of 62,572 is a 15.6 percent jump over the same period last year capping the greatest quarter and half-year performances in company history. Kia’s year-to-date sales of 328,327 is up 5.6 percent over 2015. Subaru of America reported record sales for June 2016 totaling 46,598 vehicles, a 5.1 percent gain over June 2015. Year-to-date sales of 279,458 vehicles is a 2.6 percent gain over the same period in 2015. Volkswagen of America reported sales of 23,809 in June down 21.8 percent from a year ago and year-to-date sales of 149,014 is a 14.6 percent drop from the first half of 2015. Separately, Audi reported that its June 2016 sales increased 1 percent to 18,445 vehicles with year-to-date sales of 96,934, up 3.5 percent. Mercedes-Benz USA reported June sales of 28,473 vehicles, which closes out the second-quarter at 162,777 year-to-date. Mercedes-Benz Vans also reported best-ever June sales with 3,085 units, and smart reported 407 units, bringing MBUSA grand total to 31,965 vehicles for the month, up 2.3 percent from last year. BMW brand vehicle June sales of 28,855 is a decrease of 10.3 percent in June compared to June 2015. Year-to-date, BMW brand sales of 153,436 is down 9 percent compared to the first half of 2015. Mazda North American Operations reported June U.S. sales of 26,188 vehicles, representing a decrease of 3.8 percent versus last year. Year-to-date sales through June are 145,354 vehicles, down 8.6 percent from a year ago. Volvo Car USA reported U.S. sales of 8,454 vehicles, a 41.3 percent increase versus June 2015. Year-to-date sales are up 24.4 percent year-over-year. Mitsubishi Motors North America reported June 2016 sales of 8,023 up one percent from June of last year. Total calendar year 2016 sales are 51,934, up five percent over last year.